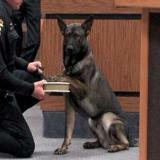 Have you heard there was a dog in the courtroom? Research into the benefits of human–animal bonding dates to the 1700s in York, England, where the Society of Friends established a facility called The Retreat to provide humane treatment for the mentally ill. Society officials theorized that having patients care for the many farm animals on the estate would aid in the patients’ rehabilitation. Through the ensuing centuries, therapists, sociologists, pediatricians, and psychologists have devoted countless hours researching the physiological benefits of human-animal interactions. Such studies have shown that the mere presence of a friendly animal can result in decreased anxiety and lessened sympathetic nervous systems arousal. Benefits include reduced blood pressure, lowered heart rate, a decrease in depression, increased speech and memory functions, and heightened mental clarity. As a result of these studies, many in the criminal justice systems have become convinced of the positive effects of using animals as a “comfort item” to aid victims during their testimony in the courtroom, particularly in child abuse cases. The use of “support persons” and “comfort items” by victims and witnesses in court has been widely accepted—and supported by general case law—for years. Specific statutes or rules may also apply, depending on the jurisdiction. The use of such support persons and items is almost always applicable in cases involving children, and often with adults, as well. In cases involving children, support persons can include parents, teachers, or victim advocates. Comfort items have traditionally included familiar objects such as toys or dolls. Increasingly, however, child advocates in the courts are expanding this list to include animals such as therapy dogs. Indeed, prosecutors and judges are finding that the presence of a well–trained dog aids witness testimony by providing the victim with emotional support and comfort both in the witness room and in the courtroom. Success stories are beginning to emerge demonstrating that the use of canines in the courtroom not only provides the victim with a more positive outcome but also offers the victim a positive, life–changing experience. More recently, the Children’s Advocacy Center of Johnson County, Cleburne, Texas, has started using a therapy dog program. They have dogs accompany children in the courts and the interviewing rooms. The program, the first of its kind in Texas, has been such a success that the prosecutors’ offices in California, Colorado, Idaho, and Michigan have contacted the center for advice on starting their own courtroom therapy dog programs. In 2007 the National Center for Prosecution of Child Abuse Update newsletter ran a two–part “Animal Assistance” series discussing the program (both parts, “The Use of Animal Assistance at Child Advocacy Centers” and “Pets in the Courtroom: The New ‘Comfort Item,’” are available online at the National District Attorneys Association website, www.ndaa.org). And victims are not the only ones benefiting from these new programs. Judges, lawyers, victim advocates, and court staff—all those who deal on a daily basis with the often–horrible consequences of crime—can find their morale boosted through the presence of dogs in court. According to Judge Wesley Saint Clair of the Superior Court of King County, Washington, “the dog’s presence dissipates tension for everyone when dealing with difficult issues and provides a sense of normalcy” ( King County Bar Bulletin, quoted at www.courthousedogs.com). The use of courthouse dogs can help bring about a major change in how we meet the emotional needs of all involved in the criminal justice system. The dog’s calming presence creates a more humane and efficient system that enables judges, lawyers, and staff to accomplish their work in a more positive and constructive manner. However and whenever a jurisdiction chooses to include a therapy dog program, the benefits will outweigh any concerns. The human–animal bond is strong and evidence of its power is being seen in therapists’ offices, advocacy centers, nursing homes and hospitals across our country. Perhaps now it is time for the courtrooms. As we become more aware of the positive outcomes that can result from the incorporation of the human–animal bonding experience in the therapeutic setting, we are also becoming more appreciative of the benefits that individuals can derive through the appropriate use of canine companions in the judicial system. It’s time our friends with paws had their day in court. This article was written by Debra S. Hart–Cohen (https://www.americanbar.org/newsletter/publications/gp_solo_magazine_hom...). Debra, who can be found at www.nauticalkennels.com, manages the law firm of her husband, Lloyd D. Cohen, in Columbus, Ohio. Both Debra and Lloyd show their AKC Champion Schipperkes in conformation, rally, agility, and obedience competition events across the country, as well as in a new event called “dancing with dogs.” Currently, Debra and Lloyd are working together on their next book, Dog Law.